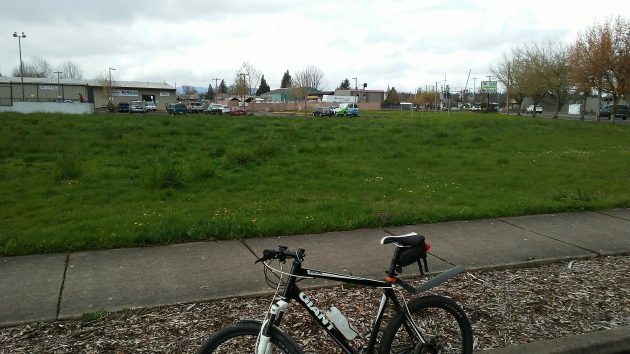 This vacant site at Pine Street and Santiam Road, near the Albany Skatepark, is where the former Main Street church may be moved. The city bought the old church for $150,000 in 2000 but later didn’t need it. One estimate weeks ago was that moving the church to a Water Avenue site and restoring it there would cost around $360,000. The Hackleman move, two-tenths of a mile up Santiam Road, might cost less. Using CARA or urban renewal money is one alternative. Councilman Mike Sykes, among others, is not enthusiastic about using tax funds for the move or restoration. If the city can’t fix the streets it should not spend money on this project, in his opinion. He favors the project but would like it to be paid for through donations the way some other Albany projects, including the new YMCA, got done. The story has been edited based on the mayor’s statement, on Facebook, that the work group’s motion to move the church was to include the center portion if possible. The church building is not original and NOT a historical landmark. Why are they WASTING our tax money on this nonsense? If they follow through with this egregious waste of money, I refuse to vote for ANY bond or tax measure! I don’t care what cause, school, fire, police or anything else. People, we need a change in our local government. Time to put some rational thought into how they spend (WASTE) OUR money. If this church is not original then how did it manage to show up in historical photos? What is your definition if historical then? Anything built before 1700 that requires paint? And this church is in the Local Historic Inventory (and also eligible for the National Historic Register). This is not nonsense, this is the heritage of Albany, which does not have any other Queen Anne church extant in the city. Perhaps it would be wise for all Albany-ians to take a knee and ask the Good Lord what She/He thinks ought to be done with This Old Church. $360K seems an awful lot until you consider the alternative. 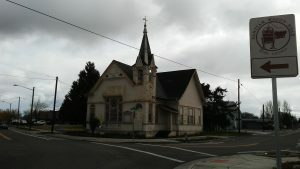 Once This Old Church is moved, the Mayor’s Study Group could generate an estimate on what it would cost to de-sanctify This Old Church and remake it into This Old Community Center. It’s a complex and complicated situation.